Municipalities and townships across Ontario are planning to and already introducing wireless mesh networks across their regions as a means of providing enhanced high speed online services to the community. Service providers deploying these networks have several technology options for every part of their network, from access to backhaul, and face numerous challenges in engineering a network that provides the best performance, highest availability, widest coverage, and lowest cost. Specifically, the cost of the backhaul network presents a significant portion of the network deployment and recurring cost. SkyNet solutions provide the highest capacity and lowest total cost of ownership in the market for backhauling the aggregate capacity through the core municipal mesh network. Whether the access method is Wi-Fi based, WiMAX, or proprietary, SkyNet provides backhaul connectivity between mesh access points and point-to-multipoint distribution nodes to the wireline network core wherever needed. Wireless Internet Service Providers (WISP) and alternative access carriers such as Metro Ethernet service providers face increasing competition and need for differentiation in the market. Residential and corporate Internet access customers continue to demand lower access costs, greater speeds, and more features. As service providers broaden their coverage and deploy higher capacity distribution and access wireless networks, such as WiMAX and Wi-Fi, the wireless backbone must also be engineered and upgraded to prevent infrastructure bottlenecks. Wireless backhaul solutions from SkyNet provide the highest capacity and lowest total cost of ownership in the market for these applications. 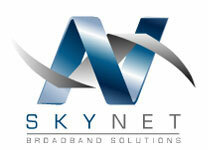 SkyNet provides high capacity IP wireless backhaul for municipal Wi-Fi, WiMAX, or any internet access network. Wireless backhaul solutions from SkyNet eliminate the reliance on leased line facilities and provide full ownership and control of the network backhaul infrastructure without recurring costs or support dependencies. SkyNet provides the most cost effective backhaul solution compared to leased line, fibre, and even existing wireless alternatives, resulting in the lowest cost per megabit-mile in the industry. There are no recurring costs, installation is simple, and the upfront capital investment rivals any alternative on the market. SkyNet solutions feature dynamic rotating encryption making it unhackable by today’s measures. With 99.999% availability and guaranteed throughput over distance, SkyNet solutions offer carrier-class reliability over leased lines or other wireless solutions under similar conditions.